Year 6 worked fantastically well alongside Reception children for World Book Day, sharing stories and discussing what they thought of them. It was brilliant to see both age groups working and reading together and I am sure that everyone benefited from the experience! Year 6 have been composing news stories based on their key text, 'Skellig'. The have been focusing on using a clear structure, a formal tone and an extensive vocabulary. Unfortunately, the video files are too large to upload to the website although they are available on our Facebook page! 24/1/19: Year 5 and 6 were lucky enough to have a visitor from parliament today. They learnt about what parliament does and how laws are passed before discussing their own ‘laws‘ and setting up their own parliament debate. Year 6 have begun their new class text, ‘Skellig’, and having been analysing the descriptive writing that the author, David Almond, uses in the text and written their own descriptions of ‘the garage’, which is ones of the scenes early on in the book. The children have also started to empathise with the main character, Michael, writing in the role and mapping out his emotions and feelings towards himself and others as the narrative progresses. In Mathematics, the children have been focusing on fractions and being able to compare them, looking at different ways of doing this and giving mathematical proof to back up their reasoning. Year 6 have come to an emotional end to their journey with Bradley Chalkers in their class text, ‘There’s a Boy in the Girls’ Bathroom’. After rewriting one of the scenes, building tension and reflecting the mood of characters in their actions, they signed off from the book by writing a letter to Carla- one of the main characters. In Maths, Year 6 have been calculating fractions of amounts and shapes, applying this to different contexts, having to work backwards and solve problems with multiple steps. Year 6 have also been making volcanoes in groups to ‘erupt’ next week! Chaffinch and Swallow classes enjoyed their trips to the library, meeting the staff and learning about the facilities there. A reminder that all children in year 6 will need a packed lunch for the trip to the opera on Tuesday and will need to be in school at 8.30. Mr Clipsham and Mr Anns. Year 6 (and Year 5) we’re lucky enough to have the brilliant David Duker come and talk to them about ’The Battle of Britain’ as a follow up to one of last year’s topics. The children heard some of the truly inspirational stories from the war that had been passed onto Mr Duker first hand by the pilot’s themselves. The children were also able to touch and try on some of the artefacts from the war itself. In English, Year 6 have continued with their work around their key text, ‘There’s a Boy in the Girls’ Bathroom’, and, after writing a persuasive text, have been writing in the role of different characters, trying to empathise with how they feel about different scenarios and using different punctuation effectively to showcase this. In Maths, Year 6 have been working on their multiplication and division written methods. They have been applying their times tables and place value knowledge whilst explaining the reasoning behind the methods and how they work. In English, we have been continuing with our book, ‘There’s a Boy in the Girls’ Bathroom’. The children have been debating whether the main character, Bradley, has a positive or negative personality. They found evidence within the text and then discussed their opinions. In Maths, the children have been looking at formal written methods of calculation. We have just finished subtraction and are moving on to multiplication. The children have been able to show their understanding and fluency in a range of ways before solving problems involving both addition and subtraction. In English, Year 6 have started their key text, ‘There’s a Boy in the Girls’ Bathroom’. The children have now met the key characters and have been writing in the role of them. They are already hooked and are looking forward to joining Bradley and Jeff on their journey through school life. In Maths, Year 6 have been recapping their knowledge of place value, ensuring that they are confident with the value of different digits within numbers, rounding and solving problems with negative numbers. The children have also reasoned with their knowledge of these concepts and explained the reasons behind their workings and thought processes. Welcome back to all of Year 6! Reading books and diaries will be coming home today so look out for them please. PE will be on Tuesdays and Fridays although children should have their PE kits in all week as this may occasionally change. 16/6/18- Here are a few snaps of the mural created by the Year 6 children alongside our resident artist, Mr Cornell. It showcases our house birds and was inspired by the works of Jackson Pollock, Jean Michel Basquiat and Julie Mehretu. Read a book that you have never heard of before. Run until you can’t run any more. Take time to look up at the stars at night. Help your parents make dinner (or make it for them one evening). Set yourself a goal, a challenge, a target, for you to achieve by this time next year and another for this time in five years. Help your mum or dad with a job around the house. Read something that isn’t a book. Think of something that you like about yourself every morning. Find out an interesting fact. We hope that you have a great half term. We are very proud of all the hard work that everyone has put in over the year so far. Good luck to all of Year 6 next week! They are all going to be amazing and show everyone how hard they have worked and how brilliant they are! They have the whole school behind them and nothing to worry about. I will be getting a good night's sleep on Sunday- I recommend it to everyone (a good night's sleep and breakfast is the secret weapon). Year 6 have been looking at documentary-style, information texts, using the work of David Attenborough as a stimulus. As well as focusing on lions, we have also written ‘A day in the life of a primary school child’ in the same style. The children have enjoyed getting into the role of David Attenborough themselves and utilising all of the grammatical skills and varied vocabulary that they have learnt throughout the year. Year 6 have been learning about a range of mathematical concepts since the start of term, from interpreting statistics and graphs, to plotting and reading co-ordinates, through to converting and using different measures in different contexts. The children are working really hard at the moment and this is showing in the work that they are producing! Chaffinch Class won again in the spelling this week, extending their lead. In the arithmetic, Chaffinches won last week but Swallow Class brought it back to win on Wednesday although both it should be noted that both classes have made huge improvements! In spelling for the next two weeks, we will be revising all of the spelling rules that have been taught throughout the year(s) alongside some 'tricky' words too. As well as looking at the different prefixes and suffixes that can we added to root words, we will be looking at the 'word family' that it is from (along with finding other words from it- eg. bicycle, cyclone and recycle). 29/3/18- Year 6 had a great time learning about and cracking different codes when we were visited by Bletchley Park representatives. They were even able to have a go at using one of the famed ‘Enigma’ machines from World War II. Year 6 also had a puzzle themed Reward day which required them to apply their code breaking and problem solving skills. The Year 6 spellings for over the Easter break will be based around the -ible/-able suffix (as well as a revision of all other spellings/spelling rules taught). Remember to think about the different suffixes and prefixes that could be added/taken off each of the words. Also, have a think about their meanings, linking to synonyms and antonyms for each of them. Well done to Chaffinch this week who won the spelling with the last word! It was extremely close. It was even closer in the arithmetic and ended in a dead heat! The spellings this week are homophones so children will need to think about the meaning of each word and the contexts in which they could be used. Year 6 have hit the ground running this half term. In Maths, they have started by recapping on their knowledge of fractions and applying it to different contexts. They have also begun to look at percentages and will be moving on to their equivalences to decimals and fractions and also, applying them to different contexts. In English, the children have continued with their class text, ‘Skellig’, using it as a stimulus to write in the role of different characters with a focus on adapting the formality of a text for different purposes. They have also looked at employing different cohesive devices. A double win for Swallow Class today has put them ahead in the arithmetic and only one behind in the spelling. Well done to all of those that worked hard on the spellings as it was very evident and will help them with their writing too! The next spellings will be based around the -tion, -sion, -ssion, -cian suffix. Remember to think about the root words and how other prefixes and suffixes can be added. The spelling focus for Year 6 will remain the same for this week. Chaffinch Class extended their lead in the spelling quiz. Swallow Class drew level in the arithmetic with a win this week. Well done to Chaffinch Class for clinching both arithmetic and spelling wins this week. Time for a comeback by Swallow Class next week! Remember to think about the root word and any suffixes and prefixes that could be added. Welcome back to Year 6! We have begun our new topic, The Battle of Britain, by looking at the timeline of events that led up to it. Next week, we will be starting our new class book and recapping our knowledge of decimals before linking it to fractions. With Young Voices coming up at the beginning of February, we have been learning the set list (as well as growing in excitement for it). As the end of the term is approaching, we have finished our key text, There’s a Boy in the Girls’ Bathroom’. After our rollercoaster ride with Bradley Chalkers, the main character, we have finally left him to continue his life without us. The children have written their own emotional goodbye letters to one of the other characters and although this is the end for our adventure with Bradley, it is the merely the beginning of our adventures across the different books that we plan on sharing together this year. Chaffinch won this week's spelling quiz to draw the scores for the term level at 4-4. Remember to think about the different prefixes and suffixes that can be added to each of the words too! This week, Year 6 have written their own balanced arguments based around their key text and one of the main characters in it. They have been using a range of adverbs and conjunctions to both evidence and counter different arguments. The children have been looking at using paragraphs appropriately to show when there is a change in subject. In Maths, Year 6 have started to look into fractions and how these can be shown in different forms and representations. Year 6 have also been writing a diary in the role of a water drop in relation to our topic about rivers. Year 6 have been busy this week. In English, we have been writing persuasive letters to one of the teachers in our key text, ensuring that we provide evidence for points that we make and linking the points and evidence with a range of adverbials and conjunctions. We have also concentrated on using formal language appropriately in this context. In Maths, we have been applying our knowledge of the four operations and applying them to different contexts, using what information we know to find out parts that we don’t. Last week, we represented the school brilliantly at the Winhills Multi-Sport Event. Swallows took the lead in both Maths and Spelling quizzes this week. Year 6 will be taking part in the Sports Event at Winhills on Monday morning so will need correct PE kit (tracksuit bottoms might be better than shorts with the weather), a water bottle and a coat (for the walk). In English, we have been continuing with our key test, ‘There’s a Boy in the Girls’ Bathroom’ and focusing on specific characters and how they would interpret different scenarios. We have also used this as a stimulus for some group performance poetry, making use of figurative language to hone in on both how characters feel and how they are perceived by others. In Maths, we have been looking into division and the different methods that can be used to calculate problems involving it. We have also been problem solving by working backwards and then having to explain the reasoning behind our methods. We have had a comeback by both classes in the week's quizzes. Chaffinch have brought the Maths back to 1-1 and Swallows made it 2-2 in the spelling. In relation conjunction with our key text, Year 6 have been looking at how to structure persuasive texts towards the end of this week and will be continuing with this on Monday. We have been looking at how to link points to evidence and discredit counter arguments. In Maths, we have been looking at addition and subtraction, something that all children have shown good progress in since the start of the week. We will be moving onto multiplication next week, using aspects of what we have learnt already this term to help us. A huge well done to the Year 6 English team who won their round of the English challenge last week and will now represent the school at Ely Cathedral in the county finals! Year 6 will be focusing on sentence punctuation this week in English, thinking about when sentences end and how to add different openers and conjunctions to them appropriately. In Maths, they will be looking at column addition and reasoning with problems involving the method. Chaffinch won the first spelling quiz of the year (hopefully, Swallows will make a comeback this week though). Make sure that you think about possible suffixes and prefixes for each word too! Year 6 have had a hard-working start to the week. They have been looking into place value in Maths, explaining their reasoning when deciding on the value of different numbers, integers and decimals. In English, they have been dissecting sentences into phrases, main clauses and subordinate clauses- something that will help them to improve their writing over the year. We have had a big whole-school push on handwriting to start the year and the children have been putting a lot of effort into the formation of their letters. Year 6 have been helping out with Maths Day as well as taking part in it themselves. They showed great leadership when working with the younger children! The beginning of a new year! Welcome back to all everyone. Year 6 have started their topic, 'Go with the Flow', about rivers, maps and the local area. We have been looking at the rivers of the world and at the counties of England. We were lucky enough to have a visitor from Anglia Water yesterday who told us all about water efficiency. Year 6 have also started the year with a focus on handwriting- already showing large improvements in this area! 13/7/17- Some pictures of the fantastic mural that Year 6 did with Mr Cornell! Year 6 have been using their design and technology skills to create their own coins from Ernest Shackleton’s era out of clay. They have also brought the story of his adventure to a close. The Year 5/6 production of Charlie and the Chocolate Factory was a huge success. All that came to watch have commented on what a great and professional job that the children did; it is a performance that will stay with us for a long time! The mural created by Year 6 alongside Mr Cornell is now complete and looks fantastic in the courtyard. Alongside Year 5, Year 6 performed Charlie and the Chocolate Factory to Year 1 today- showcasing their acting and singing skills very well. The show is nearly ready for its grand opening to parents next week so make sure that you have got your tickets! Many of Year 6 will be enjoying the first of their two transition days at either Longsands Academy or Ernulf Academy tomorrow so we wish them the best of luck (not that they will need it)! They will need to remember to take their 'All About Me' booklets with them to the days. Year 6 have begun their transition work for secondary school this week. We have been learning about different types of spirals and looking at descriptions of islands. We have also started rehearsing for our end of year production. A reminder that children need to bring back their Hilltop forms as soon as possible. Year 6 have continued with the development of their theme park this week. Children have been writing in the role of their characters on their adventure in Antarctica with Ernest Shackleton. They have also written persuasive brochures for Loves Farm and a holiday destination of their choice. Along with this, they have written their own scary stories, using the wide range of descriptive skills that they have been learning throughout the year. Year 6 have begun creating a theme park in their mathematical project. Children have taken on the role of different crew members aboard Shackleton’s ship, The Endurance. In these roles, they have had to apply for different positions- something that they have then used to apply for a job that they may want in the future. Year 6 have been exploring the circulatory system. They have annotated and examined diagrams, acting it out as well before taking on the role of a red blood cell to write a diary. A reminder that Year 6 will be attending the DLPT Sport Festival at Winhills on Monday (15th) morning. We will be back in time for lunch but children will need to remember their full PE kit, a water bottle, a sun hat and (sadly/possibly) a coat for the walk. Year 6 have been revising what they have learnt throughout the year and going over key concepts and skills to help in their SATs next week. A reminder for children to have their PE kit in everyday next week and to return their forms for the SATs breakfast- I would highly recommend that all children come along (plus, Mr Hall and I might get to eat more...). If anyone has any questions at all about the process that weren't outlined in the letter sent out last week, please come and ask. Year 6 have been looking at drawing/measuring angles using a protractor, timetables and co-ordinates in Maths this week. We are also looking over the children's knowledge of the key operations during arithmetic on Friday. In English, we have introduced the book, Shackleton's Journey. They are being teased through the book, identifying the traits of the characters and we will be writing in the role of them. A reminder that homework in Year 6 is continuing this week with pages from their revision books being handed out on Thursday and 40 minutes of Maths Whizz should be completed each week. Welcome back! The children have hit the ground running in Year 6 and have been looking into 2D shapes in Maths. We have also been looking back over some of the grammar techniques and skills that we have been learning throughout the year. A big well done to those that did extra Maths Whizz over the Easter break! In the last week, Year 6 have begun writing in the style of a documentary, using the work of David Attenborough as a stimulus. In this, we have the opportunity to show off the complex sentence structures that we have learnt throughout the year. In Maths, we have worked on algebra (and realised that it isn’t actually as hard as we first thought). We have since moved on from this to focus on ratio. We have been looking into evolution within our science topic too. Recently, Year 6 have been using their knowledge of space and measure to calculate and solve problems involving perimeter, area and volume. We have also briefly recapped on fractions and percentages. In English, we have continued our work on newspaper reports and will be using these skills in our topic work too. We really enjoyed World Book Day and creating our own evolved creatures- linking to our science- and then creating a written text of our choice to go with it (a narrative, newspaper, information text or poem). Year 6 have been looking at different measurements since just before half term. We have looked at the different ways in which capacity, length and mass can be measured and when would be most suitable to use each unit of measure. Alongside this, we have been converting between units. In English, we have begun our focus on newspaper reports and are looking at writing more formally, using the passive voice and subjunctive form effectively to do this. The author, James Campbell, has been working with our Year 6's to help them with gathering ideas for a story. In the next couple of days, they will be writing their finished product. In order maximise the impact of homework on the children’s learning, we are revising the balance of homework in Year 6. Over half term, children will need to complete (to the best of their ability as we will go over each problem in class) pages 23, 38, 50 and 79. After half term, children will be given 2 pages from their books each week to complete but will also be expected to complete 40 minutes of Maths Whizz as this will give children a good balance of the curriculum and also target each individual’s specific gaps. This should take the children an hour in total and so is no different from the usual homework allowance. We very much encourage children to complete Maths Whizz over half term too. Over half term, children will need to complete (to the best of their ability as we will go over each problem in class) pages 7, 8, 17 and 23. There will be no change to this after half term, as, each week, page numbers/activities will be set and given out. Children are still expected to read for an average of at least 15 minutes five times a week. This is an invaluable habit that positively impacts on all areas of learning. Year 6 have been looking deeper into fractions by studying their equivalences with percentages and decimals. We have also revised our key operations with fractions, including relating it to buying items in a shop. In English, after writing our own version of ‘Escape from Pompeii’ and looking into the links that appear across the narrative, we have begun to write one with a similar structure. We have also started looking into earthquakes and how to try stay safe during one. Year 6 have continued their work on fractions that started before Christmas. We have moved on from simplifying, adding/subtracting and ordering fractions to calculating fractions of shapes and quantities. In English, we have been looking at the structure of narratives. To do this, we have been studying the story ‘Escape from Pompeii’- which links to our current topic- ‘Life on the Fault Line’. Young Voices is in 2 days!!! Children will need 2 meals (lunch and dinner). Children will need several drinks for the day. Children will need a coat. T-shirts will be handed out on the day. If children have not ordered one, they should come in a white T-shirt/polo shirt. Please ensure that all medication (including cough sweets/car sickness tablets) are with the office before the morning of departure. Last week, we had the pleasure of working with the author James Campbell. He spoke to us about his books and inspired us to write our own, talking to us about ideas and about how we are all storytellers. We came to the end of our journey with Bradley Chalkers this week. We have written an emotional letter on behalf of the main character to the counsellor that helped him turn his life around. It is safe to say that the children are now just annoyed that the book has ended! 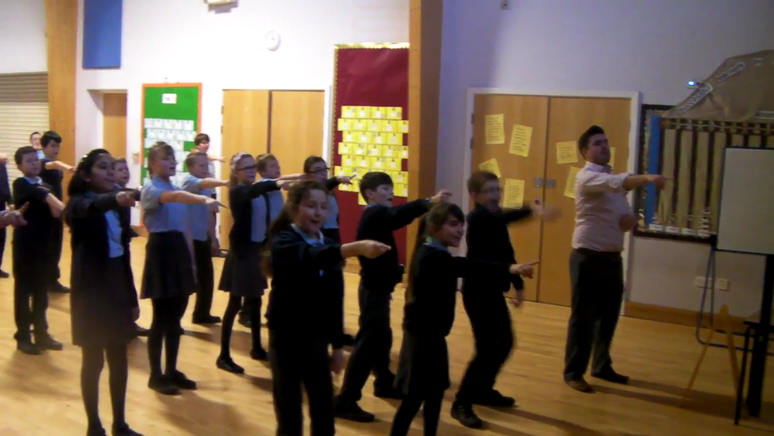 We have been practising for the Christmas Extravaganza next week, perfecting our singing and dancing for you. The Round House had a brilliant day with author James Campbell. He entertained us and made us laugh while igniting our creative sparks. He spoke to us about his books and stories whilst giving us ideas for our own and getting us to explore our own imaginations! Year 6 have been learning about different methods of division and representing problems in various ways. We will be using these skills alongside the other operations that we have been learning so far in the year. In English, we have continued following the journey of Bradley Chalkers in the book, ‘There’s a Boy in the Girls’ Bathroom’. We have also looked deeper into specific word classes by reasoning with different types of noun. We have been lucky enough to work alongside resident artist, Mr Cornell, last week too! Year 6 had a great time today at the DLPT Inter-Trust Sports Event! We narrowly missed out on the overall top spot by coming in second. This week, we have begun listening to some of the songs that we will be singing at Young Voices. In Maths, we have continued our work on multiplication by applying it to some reasoning based challenges. In English, we have explored different types of punctuation that can be used within sentences and the effect that it can have on the reader. In Science, we have evaluated our mouldy bread experiment and thought about why or why not mould grew more in some conditions than others. Here are some photos of the Year 6 children in their role as play leaders with some of the Year 1 and 2 children. A great time was had by all and the children really showcased how responsible and helpful they can be with the younger children. Chaffinches are in the middle of another fun-packed week. We are concentrating on a range of sentence structures whilst continuing with our class book, 'A Boy in the Girls' Bathroom'. The Year 6's have enjoyed acting out parts of the book and learning about the characters' consciences. In Maths, we are continuing to make sure their written methods for all for addition, subtraction, multiplication and division are perfected. In Science, the children will be learning about bacteria and we will be beginning an experiment about growing mould on Friday. Keep up the reading, maths whizz and spelling practise at home! Year 6 have been working really hard this week. We have been experimenting with different conjunctions in English and continuing with our book, ‘There’s a Boy in the Girls’ Bathroom’, and have been enjoying following the journey of Bradley Chalkers and his classmates. In Maths, we have begun working on rounding numbers and playing some different games that involve reasoning with this. Although it may seem early, we have applied our artistic skills to decorating Christmas cards that will be sent off and available to order later in the year. Our Indian drumming started this week and will be continuing for the rest of the half term too. Chaffinch class have begun the week in style. In Maths, we have been learning about the place value of numbers up to 10 million and the value of each digit. At the end of the week, we will be looking at numbers with up to 3 decimal places, ordering and comparing them. In English, we are concentrating on sentence structure. We will be beginning our class book, 'The Boy in the Girl's Bathroom', focusing on the character description and their behaviours. We will be carrying on our topic work by painting our Mayan masks. Finally, a French teacher is coming in for Year 6's every Tuesday to help prepare the children for secondary school. Welcome back to the brand new Year 6 class! We are looking forward to achieving some great things and having some fun along the way. We have started to investigate our topic, 'The Mayans', and have researched and planned how we could travel to Mexico from St. Neots, looking at time zones, prices of flights and looking at train timetables too. Just a reminder that we have Sports Day tomorrow so all children will need their PE kit but usually PE day this half term will be Monday and we will be outside for PE each week (fingers crossed) so outdoor trainers will be needed. We have been have a really busy time in Year 6!! This week 12 children attended the STEM (Science, Technology, Engineering and Mathematics) Challenge at Ernulf where they competed against lots of different school from St Neots. The children did fantastically and even came second in the maths round! Last week, the whole year group travelled to Winhills to compete in the DLPT intertrust sports games. We are delighted to say that we won the overall competition by one point!! Well done! Rehearsals have now started for our end of year play, Alice in Wonderland, and we are all very started to show you the finished product in the coming weeks! SATs are over and everyone has worked extremely hard! Well done to all of Year 6! We now have lots of exciting things to look forward to this term: next week we will be starting swimming lessons, and on Tuesday we have our topic trip to the Imperial War Museum at Duxford. Back in class, we are going to be continuing to look at our topic on the Second World War, and will be writing some fantastic pieces of writing from this. After half term, we will be looking at the Greeks, including looking at the Olympics, as we move towards the 2016 Olympic Games in Rio de Janeiro. We also have our end of year play to cast, prepare, rehearse and perform!! But what could the play be?......Watch this space! And of course, we have a trip to Hilltop at the very end of the year to look forward to....are you excited? Today, Year 6 have been using their investigative and problem solving skills to compete in the Mathematical Crystal Maze Challenge. We all did a lot of thinking and had a lot of fun too! In English, we have been writing some cross curricular (science) information reports about Neanderthals, and some of the work that has been produced has been fantastic! Well done all of you! 22/2/16- Year 6 and the whole of Round House Primary Academy had a great time with the amazing story teller: The Cowfoot Prince- Usifu Jalloh. What a great start to Book Week 2016! We have also started our picture book of the week- Bluebird. As we have narrated different parts of it, we will be moving onto creating a play script for various scenes before exploring different ways in which the book could end. Year 6 have been continuing with 'There's a Boy in the Girls' Bathroom' this week and re-enacted a scene from it before rewriting the scene themselves, utilising all of the writing skills that they have been developing. We are now very excited about our upcoming O2 'gig' and have been having our final singing practices before the big day! The children in Year 6 have been working really hard in class this week. In English, we have been continuing to read our class book, There's a Boy in the Girls' Bathroom, and the children have been exploring the characters and themes through drama and writing: in order to decide if the main character is a badly behaved person, we created a conscience alley, before writing discussion texts on the issue. In Maths, we have been working on measurements, looking at area and perimeter, and have been converting between imperial and metric systems for measure. We have also been discussed The Theory of Evolution in Science, and have looked at the work of Charles Darwin. A good start to the term in Year 6. We have been continuing our English unit following the book 'There's a Boy in the Girls' Bathroom', and the children have been captivated by the story of Bradley Chalkers; the children are still unsure whether they love or hate the main character!! In Maths, we have started to look at units of measure, and have been exploring the difference between metric and imperial units of measure. We will be starting our new topic unit on The Battle of Britain later in the week, and I hope the children are excited to find out about it (as I know myself and Mr Anns are!!). Year 6 have been sharpening up on their vocal skills, readying themselves for the Young Voices concert as well as the much anticipated Christmas Extravaganza. Our classrooms are now looking beautifully Christmassy. In English, we have begun our new text, The Boy In The Girls' Bathroom, and have been looking into the character of Bradley Chalkers, trying to make up our minds as to what type of person he is. Mathematically, we are entering the world of fractions and will be investigating them in many different contexts, making conjectures and explaining our reasoning as we go. In Year 6 we have now finished our unit on Floodland, and it was clear that although everyone loved the story, there were a few mixed reactions with the ending (we will soon add some book reviews to show you why!). We are now looking forward to starting our new novel of The Boy in the Girls' Bathroom. In maths, we have been working hard on shape, including 2D and 3D shapes, angles, properties of shapes and classification. From next week we will be looking at fractions. Rehearsals for our Christmas extravaganza are underway, and we are all excited about thrilling you with our singing and dancing! Don't forget to get your tickets ordered! This week we have been working really hard in Chaffinch class, and have been learning some fantastic things across the curriculum. In English, we are continuing to work through our unit on Floodland, although we are nearly finished! We have written some excellent information reports on the setting, Eels Island, and are looking forward to finding out if our main character, Zoe, can escape from the dreadful island. In Maths, we have been working really hard on problem solving using written and mental methods for all operations, and are starting to look at shape. Here are the songs we will be singing at the O2 in London in January. If you want these songs on a disk, bring a blank one in for Mr Gross or Mr Anns and we will put the songs on for you. What a great few weeks we've had! As a class, we are really enjoying our topic, and have written some excellent pieces on the watercycle (in the role of a water droplet!). In English, our Floodland work has really come to life, and the children are desperate to read to the end without stopping!! We have been writing a range of pieces linked to the book, and have even been acting in role and debating key aspects of the book! Will Zoe ever get off Eels island???? Write a blog with your opinion! Last week we got to work with Jack Cornell, and he has given us some excellent tips for drawing/painting water. The children really enjoyed working with him, and completed some excellent pieces of work....stay tuned for some photos! Welcome to Year 6 Chaffinch class page! Welcome to the Chaffinch class page, and welcome to Year 6 for 2015-6. Chaffinch are a Year 6 class who are taught by Mr Gross, with Ms Whitney as our Teaching Assistant. Over the year we will be learning lots of different things, whilst working really hard in the build up to our SATS. We have lots of interesting topics, lessons and trips planning, and know this is going to be an amazing year at school!! Over the year we will regularly update this page with news, information, photos and even videos to show what we have been doing in school. Keep your eyes on the blogs as we will be adding lots of new information their too! So, what are we going to be learning this year? Literacy: We will be studying a range of units this term, including looking at mystery stories, information texts, free verse poetry and a novel as a theme. We will begin by looking at a unit of work based on the novel Floodland by Marcus Sedgwick. This will link closely to our 'Go with the Flow' topic, and will see us writing a range of pieces and styles linked to the book. Numeracy: There will be a lot of learning happening this term! We will begin by looking at the ‘difference’ between numbers, number sequences, rounding, place value (including decimals) and mental calculations. We will be revising and extending our calculation methods; each child has a carefully selected method and this will be shared with parents in the next few weeks. As the term progresses, we will continue to cover the Year 6 curriculum, including data handling, shape and space, problem solving, fractions, percentages and reasoning. Mental mathematics is incredibly important and the children will be having a test every two weeks in preparation for their SATs. The results of these tests will be recorded in their homework diaries. It is essential that the children know their multiplication tables inside out and back to front (e.g. 8 x 4 = 32// 32 ÷ 8 = 4// ⅛of 32 = 4 …), so please encourage your child to practise these at home regularly. Science: Our first topic is Living Things and their Habitats. We will learn about micro-organisms, and the identification and classification of different animals and plants. After half term we will then move on to look at Evolution. In this geography topic, we will look at our local area, from town, up to our country and beyond. We will focus on rivers, waterways, and how these impact the lives of those living close to them. ICT: This term the children will be using ICT across a range of lessons. They will be carrying out research for our topic and looking at using multimedia presentations in science. PE: This term we are going to be very active in Year 6. In our outdoor lessons we will begin with a focus on athletics, enabling the children to develop the vital skills of running, jumping and throwing. We will also be looking at invasions games, including football and tag rugby. We will focus on the fundamentals of ABC (agility, balance, coordination), as well as team work and spatial awareness. Later in the term the children will be having dance lessons every week, where they will learn about movement, rhythm and the fundamentals of street dance. Year 6 will have PE sessions every Monday afternoon (both indoors and outdoors). Please ensure your child has their PE kit in school at all times, and are prepared for the unpredictable autumn weather. In Year 6, children need to read for the equivalent of at least 15 minutes every school night (it might be that some nights they read more than other nights). They need to complete their reading record each time they read. We would very much appreciate you listening to your child’s reading /discussing their book with them and request that you sign your child’s reading record book and, if possible, add a comment. This will really help your child to progress in reading and writing. Every morning reading records will be checked, so we value any feedback you can provide us with. As you can see, we have a great deal of exciting learning ahead of us. Keep checking back for updates, plus examples of our work! In the meantime, why not check out some of the sites below? Play Maths, Literacy and Science games to help you to prepare for SATS! Cool Maths games to practise maths skills at any level. Try some of the numbers games to revise skills learnt in school. Have fun! Woodlands junior is a great site and this link takes you to lots of interactive Literacy games and activities. The Science Museum in London is a great day out, but here are lots of fun interactive activities and games for you to try; all with a scientific theme. Enjoy! This is one for the parents, or for you Swallows if you want to print some worksheets to practise your skills! The maths ones are especially good since you can change the numbers to make them easier or harder. A website to help you practise your tables with different games to play. Give it a try! Get ready for SATS and have a go at these quizzes. You choose the area you want to practice and it gives you some questions to answer. It keeps your score and your time to try to beat each time. Brilliant for SATS practise! If you find Year 6 a bit hard try Year 4 or 5. Maybe you might even want to have a go at Year 7 quizzes and see how you do! Really good stuff to practise! Games and activities to practise your skills.